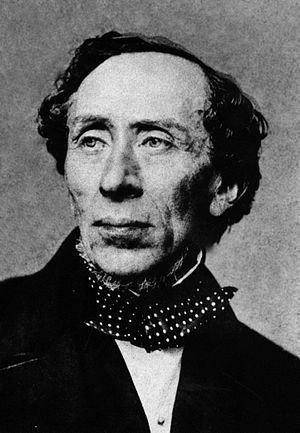 Hans Christian Andersen was born on this day in Odense, Denmark in 1805. This is the 208th anniversary of his birth. The house he grew up in was shared by 11 other people, (his mother and a father and 2 other families were all crowded into the little house.) “since he was unable to have any real physical privacy … he was forced to escape into the privacy of his mind.” [DanishNet.com] “Young Hans grew to be tall and lanky, awkward and effeminate, but he loved to sing and dance, and he had a vivid imagination that would soon find its voice.” [Online-Literature.com] Hans was educated in the basics, and trained as both a weaver’s and tailor’s apprentice. But what he really wanted to do was act. After his father’s death he moved to Copenhagen where he worked as a boy soprano in a choir. But when his voice changed, so did his job. He left the choir to try his luck as a ballet dancer, but that didn’t work out either. At 17 he met Jonas Collin, the Director of Royal Danish Theatre. Collins became his patron and sent the boy to school. Collins pulled Andersen from school in 1827 and had him privately tutored. Hans began to write again. He had success in 1829 with A Journey on Foot from Homen’s Canal to the East Point of Amager and his play Love on St. Nicholas Church Tower and then again in 1835, with his first novel, The Improvisatore. He went on to write plays, poems, prose, travelogues, and, of course, fairy tales. 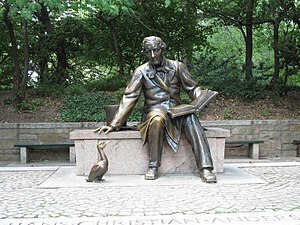 Want to read some of Hans Christian Andersen’s fairy tales? Click Here for a link to a free Kindle book. This entry was posted on Tuesday, April 2nd, 2013 at 11:42 pm	and tagged with Copenhagen, Fairy tale, Hans Christian Andersen and posted in Denmark, Europe, Fairy Tales, Hans Christian Andersen, Thought of the Day, Writing. You can follow any responses to this entry through the RSS 2.0 feed.